Fans of the 2015, über-macho film, SICARIO, will be pleased to see the return of no-nonsense CIA officer Matt Graver (Josh Brolin, DEADPOOL 2; AVENGERS: INFINITY WAR) and his quiet but lethal partner, Alejandro Gillick (Benicio Del Toro, AVENGERS: INFINITY WAR; STAR WARS: THE LAST JEDI; A PERFECT DAY). 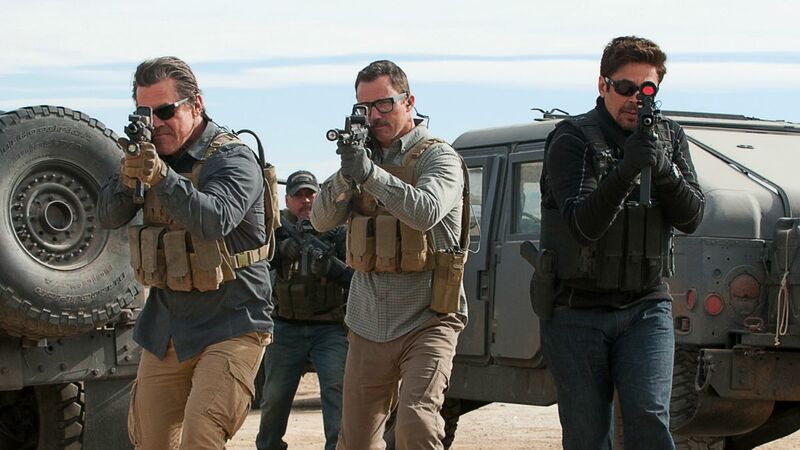 But SICARIO: DAY OF THE SOLDADO is less of a sequel than it is just another chapter in this testosterone-fueled tale of a black ops unit’s war on the Mexican drug cartels. You don’t need to have seen the first film to understand what’s going on in this one but it certainly helps. In this outing, Muslim suicide bombers arrive at a Kansas City megastore and kill more than a dozen shoppers. When US government intelligence reveals that terrorists are being smuggled into the country by the Mexican drug cartels, Graver is brought in to neutralise the imminent threat by instigating a war between the major cartels. Graver reunites with Alejandro, Steve Forsing (Jeffrey Donovan, SICARIO; TV’s BURN NOTICE) and a few others, and heads to Mexico City where the team assassinates a high-profile lawyer from the Matamoros cartel and kidnaps Isabel (Isabela Moner, soon to be seen again in INSTANT FAMILY), the teenage daughter of the head of the Reyes cartel, making it look like the rival cartel abducted the girl in retaliation for the lawyer’s execution. The team is successful in spiriting the teen out of Mexico and into the US but in their attempt to get her back across the border and into Matamoros territory, their plan hits a snag, stranding Alejandro and Isabel in Mexico. Seeing the potential for huge political fallout, US Secretary of Defense James Riley (Matthew Modine, FULL METAL JACKET) orders Graver to abort the mission and erase all proof of its existence, which includes both the girl and his friend. Directed by Italian director, Stefano Sollima, in his English-language feature film debut (Denis Villeneuve, who directed the first film, was unavailable), SICARIO: DAY OF THE SOLDADO is a tense drama that, unfortunately, isn’t quite as good as its predecessor. Taylor Sheridan (WIND RIVER; HELL OR HIGH WATER) has written this screenplay too, but there is so much going on here that story arcs get tossed into the dumper presumably to keep the film’s length to two hours. At no time do we see the two cartels going to war with each other, which is what the whole point of the operation is for. The logic that if the cartels are busy killing each other, then the terrorists will stop crossing the border is also left unclear. Moreover, that aforementioned snag reveals a huge plot hole. If you’ve seen the first film, it will come as no surprise that this film is brutally violent too, especially during the opening scenes. Be forewarned that any MAGA hat wearers in the audience may just start chanting “Build that wall” as the message these scenes sends seems right out of a certain US president’s playbook. Like the first SICARIO film, the women (and there are only two this time, the other one being Cynthia Foards (Catherine Keener, GET OUT), Graver’s CIA boss) are used as props for Graver and Alejandro. This is a film by men, about men and for men. Moner, though, is excellent as the tough-as-nails teen but unfortunately she gets de-clawed far too early on and is relegated to being an audience substitute as we learn more of Alejandro’s backstory. To the film’s credit, Brolin and Del Toro are both great here and they keep the film highly watchable even as the body count piles up. The film was released globally back in June and it was supposed to open here today but the Hong Kong distributor decided at the last moment to delay that by two weeks and program it opposite BOHEMIAN RHAPSODY. That may have been a wise move as this week’s big opening is A STAR IS BORN. If you’ve already seen the first SICARIO film or even if you haven’t, check this one out. It is violent though! Watch the review recorded on Facebook Live in RTHK Radio 4’s studio on Thursday, October 18th at 8:30 am HK time!